Hi! We’re Bazzy and Jerry. We are in the comics called ‘Bazzy and Jerry’ with all our bird friends. Tune in with us daily. 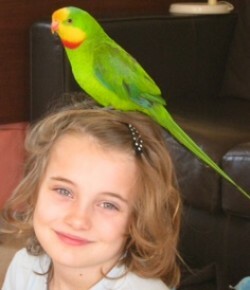 Oh, did we tell you that we are beautiful green parrots called Barrabands? Look out for us in the ‘Bazzy and Jerry Diaries’ to see what we’ve been up to. Looking forward to seeing what these two get up to! Sorry the second smiley face was accidentally a grumpy face but was meant to be a happy face!